Crater Tycho taken by the Hubble Space Telescope. This is a list of named lunar craters. 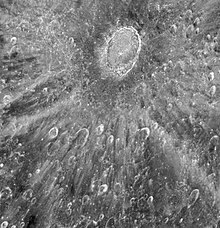 The large majority of these features are impact craters. The crater nomenclature is governed by the International Astronomical Union, and this listing only includes features that are officially recognized by that scientific society. The lunar craters are listed in the following subsections. Where a formation has associated satellite craters, these are detailed on the main crater description pages. ^ "Using the Moon as a mirror — Hubble to watch transit of Venus in reflected light". ESA/Hubble Picture of the Week. Retrieved 8 May 2012. Webb, Rev. T. W. (1962). Celestial Objects for Common Telescopes (6th revised ed.). Dover. ISBN 0-486-20917-2. The following reference sites were also used during the assembly of the crater information. This page was last edited on 12 April 2019, at 21:30 (UTC).